Moss might give your home a touch of fairytale charm, but it can be an indicator of water damage or other roofing problems — not what you need when you’re looking to live happily ever after. Here’s what to do if you see moss on your home’s roof. Does Moss Always Mean a New Roof Design Is in Your Future? If you notice moss or algae on your roof, don’t panic. Moss doesn’t always mean you’re destined for a whole new roof, nor does it mean your home has water or moisture damage. Moss tends to form in areas where it is shielded from the sun. If sections of your roof are under heavy tree cover, these are prime spots for moss to thrive. And if you live in a damp climate that sees a lot of rain, chances are you will notice telltale signs of algae or moss forming on your roof at some point in your home’s lifespan. The presence of moss doesn’t always mean that your roof has sustained damage, especially if you catch it early. Like leaves in your gutters, moss is only a problem if you allow it to grow unchecked. If you notice moss in small sections, you should remove it. You can try to do this on your own, however, most homeowners are more comfortable hiring a professional to handle the job. If you decide to tackle the task on your own, avoid using a powerwasher. Most people don’t have the knowledge or skill to prevent spray from finding its way under the shingles. If you inadvertently force water beneath your roof’s shingles, you could end up doing far more harm than good. You can also use a mixture of 50-50 water and household bleach to kill the moss. The Asphalt Roofing Manufacturers Association recommends letting the mixture sit for 15 to 20 minutes and then rinsing it with low water pressure. Don’t be alarmed if this treatment causes the moss to turn yellow or white. This means the treatment is working. As it dies, the moss will loosen, and it’ll be easier to rinse or brush away. In some cases, moss can cause serious damage. 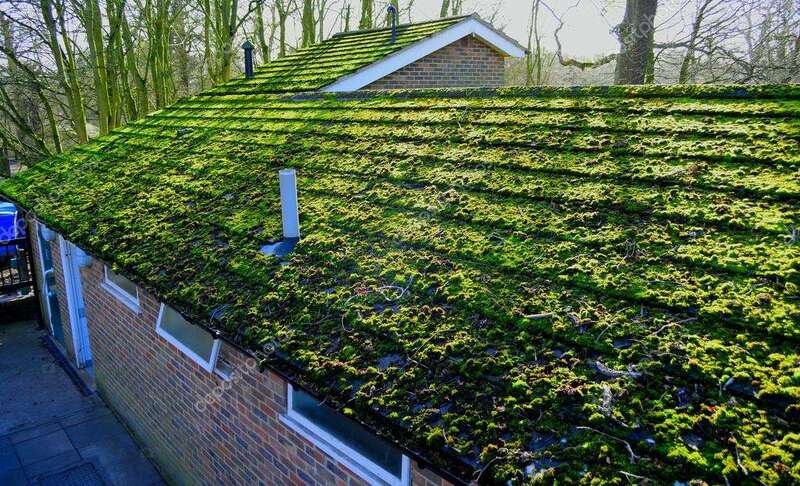 If your roof has been moss-covered for a long period of time, don’t attempt to remove it. Instead, contact an experienced home roofing expert for a free roofing evaluation. If the moss has caused water damage, your roof may be too unsafe to walk on. Don’t risk your safety. Get a pro’s opinion before you try to clean or repair your roof.